It makes sense that I would be an unofficial librarian at my daughter’s school. I grew up among books, you know—the business of words has always appealed to me. I put my enthusiasm for books on a slow simmer for a time as I pursued other things, but now, between my roles as a blogger, copy editor and librarian, it’s back at a roaring boil: I think in paragraphs—in complete, crafted sentences—and hear my life and the things I look at narrated back to me in what I wish was a lilting British accent like Jim Dale’s but is, in fact, my own voice. But, oh well. We were talking about me being a librarian. The good news (but isn’t it all good news?) is that I have a book budget and a license to hunt out quality books for our growing Classical school. I now haunt bookstores and thrift shops with a new purpose and vigor, and our house looks as though books have multiplied all over it—the tops of the shelves and the floor in front of them are filled with stacks of books, organized by their relationship to the library catalog. I am tasked with pre-reading a lot of donated chapter books, which is, as you can imagine, no hardship, except that some of them are pretty lame, and so I don’t finish those. But the good ones are really good, and I never would have found out about them otherwise. 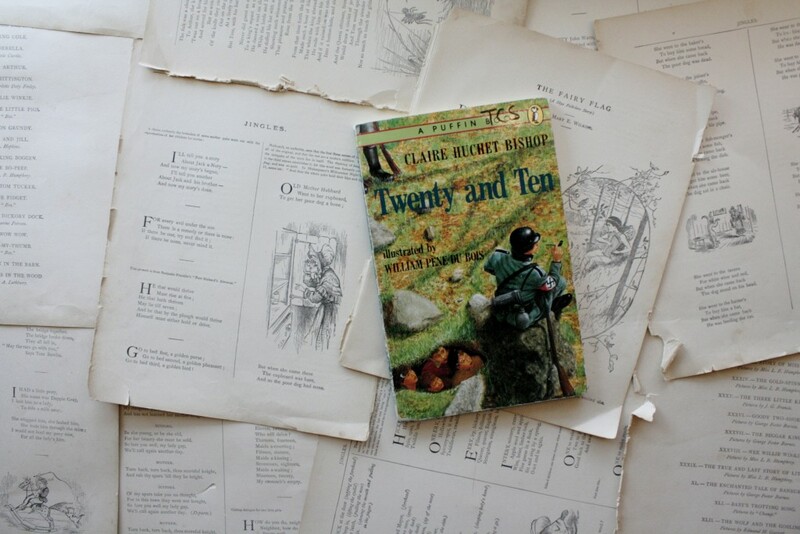 Twenty and Ten came to me in just such a box of books. It was skinny, with awkward cover art, something with a foreshortened Nazi and some kids sort of floating in the grass behind him in what looked like a puddle but was, it turns out, meant to be a cave. But the warped perspective is pardonable, for the book within the cover is graceful and concise. 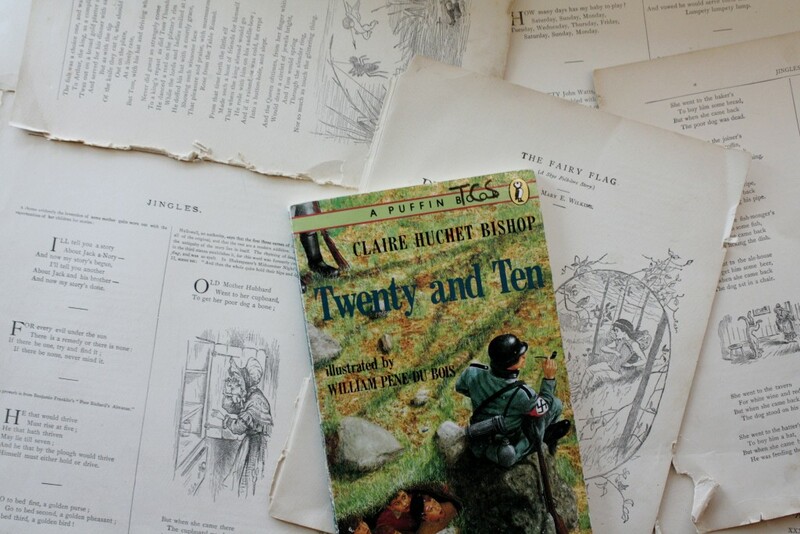 The author is an experienced storyteller—a verbal storyteller, that is—so the story rolls along in a conversational tone that makes you feel like you are sitting down to tea with the narrator, twenty or fifty years after the events of the story occurred. 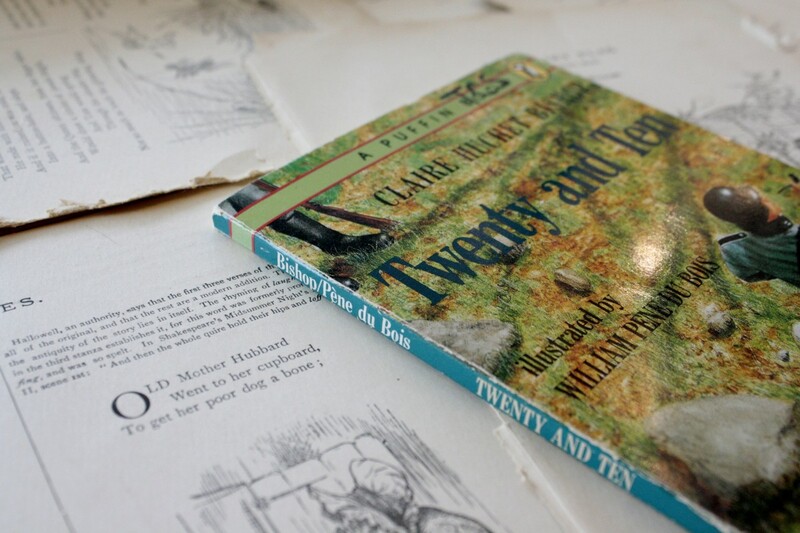 What the book is about is twenty French schoolchildren who were evacuated to the countryside during World War II, and the ten Jewish children hidden in their midst. The story ends happily and on a note of hope, but it is suspenseful and the stakes are high. This is a book for children, but it’s about WWII, and children were called upon to make some terrible decisions in WWII; because of that, I’d only recommend this book to older children—and to you, of course. It’s so slender, you’d finish it in an afternoon.